IAN Paisley has come a long way since 1949. That year the novice preacher began a mission in Belfast’s docklands and joined the anti-Catholic Union of Protestants. Nowadays, “the Big Man” sees himself as statesman rather than sectarian rabble-rouser, as the first of two hour-long conversations with the former Northern Ireland first minister, broadcast by BBC Northern Ireland this week, and widely expected to be his last formal interview, attested. Paisley, especially to outsiders, is often seen as living proof of the transformative power of the Northern Ireland peace process. A firebrand, hardline Protestant whose Damascene conversion to power-sharing with Catholics culminated in assuming power at Stormont in 2007, where he formed such a firm rapport with his deputy and one-time sworn enemy, Sinn Fein’s Martin McGuinness, that wags dubbed the pair the “Chuckle Brothers”. Now 87, and having suffered a series of health scares, Paisley seems to have one eye on what Tony Blair called “the hand of history”. Mindful of his legacy, Paisley took the opportunity of a turn on national television to paint himself as, amongst other things, a misunderstood advocate of civil rights. “The whole system was wrong, it was not one man, one vote – that’s no way to run any country. It should be absolute freedom and absolute liberty,” the founder of the Democratic Unionist Party said of the tinderbox situation in late 1960s Northern Ireland. He opposed the civil rights movement, Paisley told his interviewer, journalist Eamonn Mallie, because he felt those behind it wanted a united Ireland, something “no decent law-abiding Protestant could associate themselves with”. The problem for Paisley is that the historical record – much of it captured on the record – casts serious doubts on such irenic imaginings. He did not just oppose the civil rights movement, he actively organised raucous demonstrations against those demanding a freer, fairer Northern Ireland. In 1969, as sectarian strife began to flare on the streets, he was jailed for organising an illegal protest against a Northern Ireland Civil Rights Association march in Armagh. Paisley showed a lukewarm commitment to civil rights, too, when, in 1968, campaigner Bernadette Devlin suggested to him that the Unionist state had been unjust and unfair. There had been wrongs, Paisley conceded, but he maintained: “I would rather be British than fair”. No wonder veteran civil rights activist Ivan Cooper last week described Paisley’s version of his past as “all over the place”. While Paisley attempted to present a more emollient self for the television audience, the egotistical, divisive side of his character occasionally bubbled to the surface. Such as the callous comment that the 33 victims of the 1974 Dublin/Monaghan bombings – the highest toll in a single incident in the Northern Irish conflict until the Omagh bomb – had brought the attacks on “themselves” through their support for Dublin’s government. Paisley stood by a previous remark that the IRA were the armed wing of the Catholic Church: “Well that’s true, it stands true in history. They have been, the people of the church of Rome, used to further their interests,” he said. This is the same Paisley who, in his younger days, had organised a mock Mass on the platform of the Ulster Hall. Paisley is “a complex and protean personality who imagines cyclones of blessings, compares himself to the diminutive Mahatma Gandhi,” Northern Irish poet Tom Paulin wrote in the London Review of Books in 1982. Not much has changed 30 years on. The man who founded first his own church and then his own political party, before finally ascending to the highest office in the land, remains a chimera. 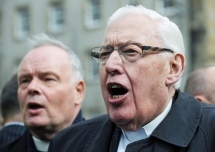 “One of the strongest features of Puritanism,” Tom Paulin noted, “is its autobiographical tendency, its passionate self-regard.” Few people embody this inclination to the same degree as Ian Paisley. Over the years, Paisley – who was born in 1926 to an Evangelical father and a mother who was, in his own words, from “a Scots Covenanting home” – has produced dozens of books combining fire and brimstone theology, sermonising and autobiography. His decision to participate in the BBC interviews also reflects how much his self-regard is still smarting at his being bounced into relinquishing control of the DUP, and the Stormont assembly, to Peter Robinson in 2008. The former head honcho has been a persistent back seat driver ever since. Paisley has not been able not resist the temptation to take a sideswipe at his former number two; in next week’s interview he denies any responsibility for Peter Robinson’s farcical incursion across the Irish border in 1986 as part of protests against the Anglo-Irish Agreement. Robinson has reacted angrily, describing Paisley’s account as “a failure of recollection”. Sources within the DUP said Mr Paisley was among the organisers of the ill-fated invasion, during which a couple of hundred loyalists paraded in the square before being forced back over the border by Irish police. Paisley has frequently denied any involvement in violence but, as Paulin observed, “a dynamic millenarian rhetoric can inspire men to place actual dynamite under the status quo”. How many loyalist paramilitaries did Paisley’s fiery rhetoric rouse into action? We will never know. But in his BBC interviews Paisley shows no compunction about his involvement with the Ulster Defence Association during the 1974 Ulster Workers’ Strike, the campaign that he led which eventually toppled the Sunningdale Agreement. It is easy to caricature Paisley as an arch-unionist, but he is probably better described as an Ulster nationalist. His relationship with Britain – and Britishness – has been marked by ambivalence over the years. The “No” politics that Ian Paisley personified for so many years is still alive in Northern Ireland – as the recent aborted Haass peace talks illustrated. Paisley is not the demagogue he once was, but, as these interviews demonstrate, neither is he the uncompromised “peacemaker” he yearns to be. This piece originally appeared in the Scotsman, 17 January 2014. Have you heard the one about the government minister who, at Christmas, took his cabinet colleague to court in a row over public spending? This might sound like the set-up to a festive gag for political anoraks, but it is exactly what transpired at the High Court in Belfast last week. Northern Ireland finance minister Simon Hamilton, a Democratic Unionist, initiated the legal action against Sinn Fein agriculture minister Michelle O’Neill. Mr Hamilton won. From now on, Ms O’Neill will have to seek approval from the rest of the Stormont cabinet over how she distributes European funding. This, increasingly, is how politics works in Northern Ireland. So it probably should not come as too great a surprise that cross-party peace talks – even those with the imprimatur of the United States – failed to reach a compromise on New Year’s Eve. But the inability of the five Stormont executive parties to do a deal under the watchful eyes of former US peace envoy Richard Haass was still a shock. In the days – even the hours – leading up to Tuesday’s deadline, Northern Irish political leaders had made positive noises to the media. Dr Haass himself had said he was confident of reaching “meaningful agreement” when he returned to Belfast before Christmas. Northern Ireland, of course, had been here before, too. From Good Friday, in 1998, through to St Andrews in 2006 and Hillsborough four years ago, every significant agreement in the peace process had been forged in the smithy of late-night brinkmanship. Every time collapse had seemed imminent but, at each juncture, common ground was, eventually, found. Like most observers, I assumed that another dose of “constructive ambiguity” – a fudge – would reconcile unionists and nationalists on the three big issues of the day: flags, parades and the past. But not this time. Instead, Dr Haass left Belfast’s Stormont Hotel a failure. Sinn Féin had said they were prepared to recommend the proposals to their executive, but unionists would not sign up to Haass’ seventh and final draft late on Monday night. Despite Haass’ protestations that he has created a platform upon which compromise can be built, the reality is that little progress his been made. “Nothing is resolved. There is ambiguity about the process. There is ambiguity about the outcome. We are no closer to understanding the needs of victims, no closer to addressing the past, no closer to an agreement on flags,” a source inside the Haass talks told The Scotsman. So where does the fault in this failure to reach an agreement lie? In the zero-sum game of Northern Irish politics, the temptation is often to accord blame equally: “a plague on both your houses.” Certainly, recriminations have come quickly on both sides of the sectarian divide: on Tuesday night, just hours after the talks broke up, Ulster Unionist Party negotiator Jeff Dudgeon blamed the cross-community Alliance for the process failing, a far-fetched accusation that gained little traction. When searching for culprits to finger, Mr Dudgeon would do better to look closer to home. As the final version of the Haass proposals, published on the devolved Stormont government’s website, makes clear, it was unionists who stood firmly in the way of a deal. On a raft of issues, most notably on parading and the past, nationalists, and particularly Sinn Fein, made a number of concessions. But unionist leaders, more worried about being outflanked from the right – by flag protesters such as Jamie Bryson and Willie Frazier and the hardline Traditional Unionist Voice’s Jim Allister – than doing a deal with Irish nationalism, remained intransigent. After Haass left, Democratic Unionist party first minister Peter Robinson said: “I detect from each of the parties a willingness to work on to complete the task.” A wonder, then, why Mr Robinson did not decide to stick around for the crucial final plenary session of the talks on Monday night. Ulster unionism has previous when it comes to snatching defeat from the jaws of victory. You would never know it to listen to Peter Robinson or Ulster Unionist leader Mike Nesbitt, but Northern Ireland’s place in the union has never been more secure. The constitutional question is essentially settled in Northern Ireland – far more settled, at least, than it is here in Scotland. The Good Friday Agreement enshrined the principle that only the democratic will of the people of Northern Ireland can change its constitutional status. Opinion polls put support for a united Ireland at just one-fifth. But instead of celebrating their triumph, unionist leaders are embroiled in a myopic culture war that is driving a further wedge between communities in Northern Ireland, in the process making compromise almost impossible. When Belfast City councilors voted last winter to fly the Union flag from Belfast city hall on designated days, rather than all year round, unionists had an opportunity to claim a history victory. Irish republicans – who just a decade-and-a-half earlier had fought an armed campaign against the British state – were now voting to fly the red, white and blue on the Queen’s birthday! How did unionism respond? By decrying a democratic decision as an assault on Protestant culture, effectively sanctioning flag-waving loyalist protesters that almost brought Belfast to a standstill. Meanwhile, a protest camp has been in place since July on north Belfast’s Twaddell Avenue, after an Orange Order parade was prevented from passing through a nearby Catholic area. Unionists should not take all the blame for the Haass disaster. Ms Villiers’ party leader, David Cameron, has shown neither aptitude nor inclination for Northern Ireland since he assumed office. Westminster should have been at the Haass table. These were issues it had a real say in: parading is not devolved, flags are about sovereignty, and the British state was hardly a silent partner in the murky world of “the past”. But instead the British government watched Haass from the sidelines. Reports of the Good Friday Agreement’s demise are greatly exaggerated. But the default setting at Stormont is conflict, not compromise. “We are in a power-sharing government but we are not sharing power. We are firmly embedded in our own fiefdoms without any sense of responsible, just government,” says John McCallister, deputy leader of the new liberal unionist party NI21 and a former member of the Ulster Unionist Party. With European and local elections this summer, a Westminster vote next year and devolved elections due in 2016, the political temperature in Northern Ireland is only getting to get hotter. Which is good news for Belfast High Court lawyers, but not for the many people in Northern Ireland who are fed up with “extraordinary” politics. This column originally appeared in the Scotsman, on January 6, 2013. Sectarianism goes beyond football matches and a proper understanding is vital if we are to release the hold it retains on some, writes Peter Geoghegan. In Scotland, “sectarianism” is one of those words that are guaranteed to spark debate. For some, bigotry is a poison that infects every pore of society, from the workplace to the terrace. For others, it’s a relic of a dim and distant past, overstated, overindulged and often met with a rolling of the eyes. Responses to last week’s report on sectarianism commissioned by the Scottish government typify Janus-faced attitudes to what James McMillan (in)famously dubbed “Scotland’s shame”. “Scotland growing tired of sectarianism”; “Sectarianism still a force in Scotland”; “Old Firm still to meet bigotry study group” and “Sectarianism not caused by denominational schools” were among the eclectic headlines that greeted the findings of the advisory group on tackling sectarianism in Scotland. Sectarianism, as Duncan Morrow, the chair of the advisory group established last August, noted at the report’s launch in Glasgow on Friday, “is an issue that is either dealt with by silence or sensationalism”. Having spent his career toiling at the coalface of community relations in Northern Ireland, Dr Morrow knows a lot about sectarianism and there is much to commend in his report – not least that now, almost a decade and a half after being established, the Scottish parliament has a firm basis on which to ground its well-funded anti-sectarianism strategies. While the report’s sections on football and education have understandably grabbed most attention, arguably its most useful service is in providing a clear definition of what sectarianism actually is. Sectarianism is often understood in purely religious terms – Catholic or Protestant – but the way these identities are formed owes far more to ideas about politics and ethnicity. Just as in Northern Ireland, bigotry here has little, if anything, to do with doctrinal differences between Catholics and Protestants: calling someone a “Hun” or a “Fenian” is not a cipher for a theological debate about consubstantiation versus transubstantiation. Instead, as the advisory group recognises, sectarianism has everything to do with how “them” and “us” are created, and then maintained through symbols, from football clubs to flags to parades. The report also brings a much-needed dose of reality to the often febrile conversation about sectarianism in Scotland. Bigotry exists – there have been more than 7,000 sectarian incidents reported since 2003, with only 30 per cent of those occurring at football matches – but it is not the over-arching structural inequality it once was. Large-scale migration to Scotland from Ireland began almost 200 years but it was only in the 1950s and early 1960s, with the advent of new foreign-owned industry and the nationalisation of older manufactures, that discrimination against Catholics started to end. Fifty years ago someone like me – a first generation Irish Catholic who has lived in Scotland for almost ten years – could have expected to face discrimination in most avenues. Certain firms categorised job applications by religious affiliation, and Catholics were rarely given skilled posts. But in my time on this side of the Irish Sea, I’ve only been on the receiving end of sectarian discrimination once, and that was from a foul-tongued teenager in a bus station in Glasgow at one in the morning. That is not to say that sectarianism does not exist in Scotland. At last Friday’s press launch for the advisory group report, in Glasgow, Dr Morrow was grilled about the focus placed on institutions, and specifically local authorities, in failing to adequately address sectarianism. It has become a truism to say that sectarianism is a thing of the past in Scottish workplaces – since 2003, it has been illegal for employers to discriminate on grounds of religion and belief (and no belief) – but there are plenty of recent examples of sectarian behaviour in the public sector, from the two Stirling council staff investigated in 2011 for posting anti-Catholic messages on social media to the bin man in Airdrie who, because he supported Rangers, was attacked with a shovel by a colleague. “All local authorities should embrace the issue of tackling sectarianism with the conviction and confidence with which they have approached other equality issues,” last Friday’s report avers, quite reasonably. But the problem remains one of leadership. Despite the best efforts of Jack McConnell, sectarianism was largely absent from public discourse in Scotland until 2011, when a combination of parcel bombs and fisticuffs aimed at Celtic manager Neil Lennon catapulted the issue on to the media agenda, nationally and internationally. The Scottish government has, to a large extent, put its money where its mouth is. Around £9 million in funding is being invested in anti-sectarian work; while a lot of this cash is going to the police, a sizeable chunk has been handed to voluntary and community groups. But there still seems to be resistance in some quarters: as many headline writers noted last week, neither Celtic nor Rangers managed to find the time to meet with the advisory group during the last 16 months, despite both clubs profiting handsomely from public funding for anti-sectarian initiatives (to the tune of around £1m each over the last decade). The danger now is that having done sensationalism for the last couple of years, Scotland could revert to the status quo when it comes to sectarianism, silence. The advisory group report makes a series of useful recommendations – including the suggestion that parades balance the right to march with the rights of communities and that there is no need for further legislation to tackle sectarianism – but institutional change will require active political will at every level. A genuine discussion about shared campuses in our schools is long overdue. Nil By Mouth has itself contacted 120 quangos in Scotland offering free anti-sectarian training. One would hope that each organisation takes up the offer. A couple of days before the advisory group report was launched, I found myself standing beside a 40-foot high corrugated metal fence at Cupar Way in West Belfast. The euphemistically titled “peace wall”, the longest such barrier in Europe, separates Catholics on the Falls Road from Protestants on the Shankill. Every night at seven o’clock a gate linking the two sides is bolted shut. Nobody I met in West Belfast thought the wall would come down any time soon. Thankfully walls topped with barbed wire do not divide Catholics and Protestants in Scotland, but many still live largely separate existences. Sectarianism here is not the all-encompassing behemoth, but there are still too many barriers in too many people’s minds. Dr Morrow’s advisory group has provided the Scottish government with a road map; they now need to follow it. This column originally appeared in the Scotsman, 19 December, 2013. Kosovo is crying out for change, writes Peter Geoghegan, and, increasingly disillusioned with the political system, voters have turned to electing a comedian to office. Are comedians the political voices for the apathetic generation? If the reaction to Russell Brand’s recent decrees is anything to go by, they could well be. But while Brand was scribbling in the New Statesman and chatting to Paxman on Newsnight last month, in Kosovo a comic was in the process of actually getting elected to the council in the capital, Pristina. The Strong Party campaigned on an, eh, unorthodox manifesto – legalise corruption; privatise everything; construct a Formula One racing track around Pristina and universities in every village and neighbourhood. The party, which took around 2 per cent of the vote and a seat in Pristina, was decried as a “joke” but their message was a serious one – the ludicrous campaign promises were all either exaggerated versions of other parties’ pledges, or cleverly realised digs at Kosovo’s dysfunctional political system. “We are a group of young people who are angry. But if you just criticise you are not doing anything new. By not opposing (other political parties), by becoming one of them we are showing how ridiculous they are,” the Strong Party’s “Legendary Chairman”, 26-year-old Visar Arifaj, told me when we met over coffee in one of Pristina’s myriad cafes, last week. The average age of the party’s 1,500 vice-chairmen is just 24. Kosovo is the youngest state in Europe – in more ways than one. It is just five years ago since independence from Serbia was declared; half the population is under 25. For this generation, the war a dim and distant memory, the failures of the present are paramount. “There is dissatisfaction among the young,” says Dren Pozhegu, a youthful policy analyst. Among 15-24 year olds unemployment stands at an eye-watering 53 per cent, according to statistics from the office of the Kosovan prime minister. No wonder so many have, as Pozhegu says, “lost the belief in change”. Part of the problem is the kind of change that Kosovo has experienced since the war with Serbia was brought to an end 14 years ago. Privatisation is a case in point. At one end of pedestrianised Mother Theresa Boulevard, Pristina’s main thoroughfare, is the hulking frame of the 13-storey Grand Hotel. Built in 1978, the 350-room Grand was once the epicentre of Kosovan high society. During the war, it housed the Serbian army and the press corps. The hotel was privatised in 2006 and now stands dilapidated and half-empty, open to guests but in no fit state to receive them. After the war, many former US officials returned to Kosovo for the privatisation boom — in telecom, mining, or other lucrative government contracts — including US former secretary of state Madeleine Albright and James W Pardew, formerly a special envoy to the Balkans under president Clinton, who was at helm during the Nato bombing campaign against Serbia in 1999. Kosovo’s privatisations have been “a very dubious process”, says Muhamet Hamiti, erstwhile Kosovo ambassador to London and adviser to former president and independence leader Ibrahim Rugova. Connected to the privatisation process has been arguably the biggest problem facing the young Kosovoan state – corruption. Backhanders and payoffs have been widely seen as an almost routine aspect of awarding government contracts. The head of Kosovo’s anti-corruption task force was recently arrested – on corruption charges. “Corruption is endemic. It is a fog that everyone can see but you can’t reach out and touch it, you can’t grasp it,” a very senior international source in Kosovo told me. In 2010, the first governor of independent Kosovo’s Central Bank, Hashim Rexhepi, was arrested on corruption charges. But an investigation by the Balkan Investigative Reporting Network found serious errors in the charges against Mr Rexhepi, amid suggestions that he had actually attempted to stand up to political interference and corruption. Corruption, of course, is not confined to Kosovo – across the former Yugoslavia, states struggle to control graft. But in Kosovo, there is a European mission, EULEX, dedicated solely to upholding the rule of law. EULEX has not been inactive – just last week a prosecutor indicted 15 former Kosovo Liberation Army fighters on war crimes charges – but they are widely seen as failing to get a grip on corruption and organised crime. The international community has put a premium on regional stability, making it difficult – if not impossible – to pursue charges against suspects closely connected with the government of prime minister Hashim Thaci in Pristina. “The rule of law sits uncomfortably with the grand desire for stability at all costs,” a source told me. An April peace deal brokered by Baroness Ashton in Brussels between Kosovo and Serbia was intended to cooper-fasten this “stability”. Under the terms of the agreement, Serbia would recognise the authority of Kosovo’s government over the police and the courts in the restive, ethnic Serb-dominated north in return for greater autonomy for Serbs across Kosovo. Successful implementation of the accord is widely seen as crucial to both Kosovo and Serbia’s European Union ambitions. “The EU want short-term peace and stability but they don’t care how it is achieved,” opposition leader Albin Kurti said when we met in the offices of his party, Vetevendosje (Self-Determination), in Pristina. Kurti, a former student leader, political prisoner in Serbia and adviser to the political representative of the KLA during the war, has been a vocal critic of the international presence in Kosovo and the political system they have done much to support. “Before the war we had equality without freedom. That was prison. Kosovo has had successes – local elections held earlier this month were widely hailed as the freest and fairest yet (aside from in the north, where violence and intimidation marred voting, necessitating a repeat election in North Mitrovica on Sunday). There is economic growth – just not enough of it – and Kosovans display an entrepreneurial spirit that would be the envy of any nation. Pristina is a city teeming with creative young people – and, as the Strong Party attests, it is not just Russell Brand who is fed up with the political status quo. More houses, not more schemes that will push up house prices, are what is needed, writes Peter Geoghegan. This column originally appeared in the Scotsman, October 8, 2013. The proportion of Catholics in Northern Ireland has increased in the last decade, according to census figures released yesterday. The census shows that 48.36 per cent of the resident population are either Protestant or brought up Protestant, while over 45 per cent are Catholic or raised Catholic. The census, which was held in March 2011, recorded a 5 per cent drop in Northern Ireland’s Protestant population from 2001. The proportion of Catholics has risen by one per cent, to 45.14 per cent, fuelling suggestions in some quarters that Catholics could outnumber Protestants within a generation or less. The fall in the Protestant proportion can be explained by migration and the presence of an older population with a higher mortality rate, Dr Jonny Byrne from the Institute for Research in Social Sciences at the University of Ulster, told the Scotsman. The census was conducted by the Northern Ireland Statistics and Research Agency on 27 March 2011. The statistics released yesterday provide a wide ranging profile of the Northern Ireland population covering health, housing, educational qualifications, labour market activity and migration but by far the most closely watched findings relate to demography and identity. Since 2001, the Northern Ireland census has included a question asking what religion a respondent was brought up in. Those who do not state a religious affiliation but who do indicate that they were raised as Catholic or Protestant are reassigned into the appropriate ‘community’ category using answers to this measure. In the 2011 census, statisticians were unable to designate seven per cent of respondents as Catholic or Protestant, an increase of four per cent compared with the 2001 census. Most of those now designated as having no religion would have previously been classified as Protestant. For the first time, the Northern Ireland census included a direct question about national identity. Two-fifths (40%) said they had a British only national identity, a quarter (25%) had Irish only and just over a fifth (21%) had a Northern Irish only identity. The census results come during a difficult period in Northern Ireland, with on-going protests, sparked by a decision to fly the Union Flag from Belfast City Hall on fifteen designated days rather than throughout the year. On Monday night, a loyalist mob firebombed a police car outside the office of Naomi Long, Alliance party MP for East Belfast. Northern Ireland’s growing Catholic population does not mean that Irish unification is just around the corner. In July, the Northern Ireland Life and Times Survey found that fifty two per cent of Catholics living in Northern Ireland wanted that union to continue. Only 35 per cent wanted a united Ireland. 1.811m: The population of Northern Ireland in March 2011, up 125,600 (7.5 per cent) on a decade earlier. 338,544: the number of respondents aged 16 and over who had achieved Level 4 or higher qualifications (24 per cent). 416,851 had no qualifications. 59: the percentage of people usually resident in Northern Ireland who hold a UK passport. Twenty-one per cent hold an Irish passport; 19 per cent have no passport. 17,700: the number of people who speak Polish, the most prevalent main language other than English (1 per cent). 11: the percentage of usual residents aged three years and over with some ability in Irish in 2011 (compared to 10% in 2001). 8.1 per cent had some ability in Ulster-Scots. This piece originally appeared in the Scotsman on Dec 12. That security forces colluded with loyalist paramilitaries in Northern Ireland during the Troubles has long been common knowledge, but David Cameron was right yesterday when he described the levels of state collusion uncovered by Sir Desmond de Silva QC as ‘shocking’. De Silva found that the men who murdered solicitor Pat Finucane at his home in west Belfast in February 1989 were agents and informers working for the state, via the army’s Force Research Unit (FRU). Shocking is the only word for it. The Royal Ulster Constabulary was aware of two previous plans to kill Finucane earlier but declined to inform him. De Silva also found that state forces were supplying the loyalist Ulster Defence Association with the bulk of its intelligence. The shadowy Force Research Unit has already been implicated in the deaths of at least 14 Catholics in the 1980s, during which time British Army Intelligence Corps double agent Brian Nelson was also intelligence chief for the UDA. In 1990, Sir John Stevens found little evidence of collusion between the security forces and loyalist paramilitaries, but the former head of the Metropolitan police has since revised his view. David Cameron has previously rejected calls for a full inquiry into Pat Finucane’s death, most voluably from his widow Geraldine, but the pressure for a full investigation is only likely to grow. The de Silva report comes at a difficult time for Northern Ireland, with on-going loyalist protests across the country following the decision to limit the flying of Union Jack from Belfast City Hall to fifteen designated days a year. Yesterday, census results showed that Northern Ireland’s Protestant population had slipped below 50 per cent for the first time. The scale of the collusion uncovered by de Silva also begs the question whether an independent review is needed into all suspected cases of state collusion during the Troubles. Such a process would doubtless prove controversial, for political and economic reasons. While Sinn Féin would almost certainly support the proposal, the Democratic Unionist party would oppose it. Inquiries are expensive, too: the Saville inquiry into Bloody Sunday cost £191m. But an independent review could work if both the British and Irish governments committed to declassifying documents relating to the Troubles and participating in a series of more focused reviews targeted at specific incidents where security force involvement has been questioned. Shocking as it is, the de Silva report suggests that there is more to learn about the nature of the British state’s involvement in the chaotic violence of the Troubles. This piece originally appeared in the Scotsman on December 13.